In 1821 Nicolas Rieussec tested his invention of recording time at a horse race in Paris. 190 years later Montblanc makes a tribute to the man. 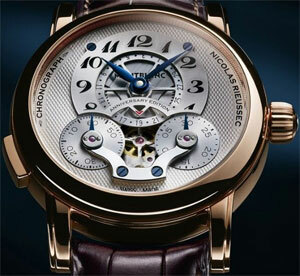 Montblanc created a watch with the name “Montblanc Nicolas Rieussec Chronograph Anniversary Edition”. The rose gold version will be available as a set of 190 pieces, 90 pieces in white gold, and the platinum model will have only 20 pieces available. Prices will be between 30 000 – 40 000 for the gold ones and over 50 000 for the platinum models. The result of these watches is beautiful. Every little detail is perfect and this is a very high-class timepiece.